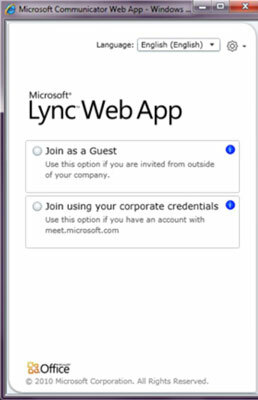 The Lync web app is a browser-based alternative for joining Lync online meetings. For it to work, the browser must have Silverlight enabled. Silverlight is a cross-browser (Internet Explorer, Safari, Chrome, and so on. ), cross-platform (Mac, Windows, and Linux) plug-in that enhances user experience and the delivery of applications on the Internet. Attending a meeting by using the web app is similar to attending the meeting by using the desktop client. The advantage of using the web app, however, is that the participants do not need to install additional software to attend and view online meeting presentations. When using the web app, you will not be able to use the Present a PowerPoint feature of Lync. In addition, voice and video capability is not yet available for the web app, so participants must connect to the audio portion of the meeting by using a dial-in number. Open the Online Meeting invitation. Click the Join online meeting link or copy and paste the meeting URL into a browser. Complete the onscreen information, such as your e-mail address, and click Join Meeting. Enter your office or cellphone number on Phone Details and click Call Me. The Online Meeting calls you and connects you to the conference.